think i’m safe here too, this is mum’s present but a) not sure if she visits here and b) she’s finished work and has no internet access at home. 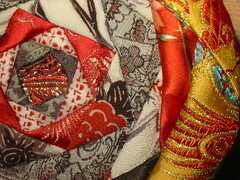 another recycled kimono piece from my omiyage book. this was pretty damn fiddly, as i should have expected from my previous experience. there’s very little sewing involved in this, it’s almost entirely glued. 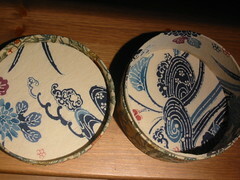 the pieces on the top are lightly padded. the most accessible (reasonably disposable) fibre in my stuffed-full stash box was bamboo. on reflection this wasn’t a great choice - the staple is very long so as soon as one gluey fibre escaped the whole lot wanted to come with it. finishing the edges neatly was next to impossible too. each piece is folded in half to enclose the stuffing and then glued in place slightly overlapping the previous piece. i ended up turning the edge of the lower layer up and the edge of the upper layer down and gluing inbetween, then nudging the lower layer back so that only the upper layer is visible at the edge. if that makes any sense at all, i can see why she didn’t explain any of this cos it would make the book 3 times as long! since i hadn’t found her instructions very reliable i went my own way a little when i came to the size of the fabric pieces for covering the base of the box - her sizes really didn’t sound right. 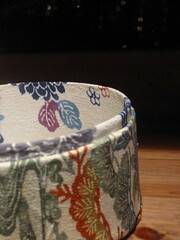 there are a couple of places where, with hindsight, it would have been better to make the fabric overlap a particular edge - where that edge was visible in the finished item - rather than finishing at the edge and risking the edges of the fabric and the cardboard showing. i’m not so sure about the fabrics on the top . 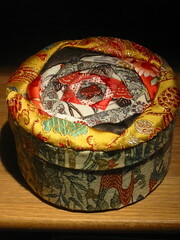 the pieces are so small (the box is 6” diameter) that the designs and character of each fabric are rather lost. also i think it would be better to have more contrast between the colours of the top pieces. i chose fabrics that were well co-ordinated, which would have worked well with a larger expanse of each, but now i think they blend into each other too much.